Brent crude fell to $68.34 a barrel on Monday at the opening of the trading day in Asia. Plunging oil prices are the worst since the collapse of financial system in 2008. 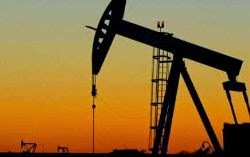 Bloomberg said today that the declining oil prices threatens to have the same global impact of falling oil prices three decades ago, which led to the Mexican debt crisis and the end of the Soviet Union. UPDATE: Brent recovered some of its losses on Monday and was trading at $71.83 a barrel in mid-day.